Client Remks:Welcome To The Berwick! Brand New Building 942 Sq Ft Cc Model With South East Views From Bedrooms And Living. 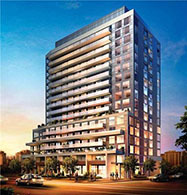 Great Space With Two Balconies & Location With Easy Access To Subway, Shopping, Gym And Amazing Restaurants. Enjoy The Life Living In The Vibrant City. Master Bedroom With 4 Pcs Ensuite. Hardwood Floors Throughout And Lots Of Upgrades! Extras:Ss Stove, Microwave, B/I Dishwasher, Washer, Dryer. Building Amenities Include Gym, Media Room, Party Room, Guest Suites, 24 Hour Concierge And Much More.